In my post of two weeks ago I mentioned that a fellow sandwich enthusiast was rather negative on white bread. This is no small matter to him. As a small child, I would eat no bread but white bread, and considered wheat bread to be disgusting. And then I was eight years old and I boarded an airplane for the first time. I sat at a window seat, refusing to peel my face away from the glorious spectacle as we peeked above the clouds. I turned around only when the stewardess asked me which sort of bread I would like on my sandwich. I asked for wheat bread, and I was stunned to hear myself. Minutes later, she brought a turkey on wheat. I loved it. I loved all of it, and I didn’t much care for bleached sugar-bread after that. I was eight, and I was short and light, and I had yet to discover my first kiss or car or job or lease. But it was at this point that I became a grown-up. I understand his point, and I sympathize. I certainly look for sandwiches with bold flavors, sandwiches that embark in new, interesting directions. But that is not always what one wants, and that raises the question of whether or not something bland or boring can genuinely be appropriate. That is a valid question, and the answer raises something that makes me consider how I view sandwiches. I have long said that balance is the most important element of a sandwich. It is not solely a matter of meat or bread or sauce or of any ingredient. A single strong ingredient can save a mediocre sandwich, as seen in sandwiches such as the California Fresh, but a truly great sandwich needs an equal contribution from every element. Or so I thought, anyway. I’m not willing to completely divorce myself from that idea, but I am starting to suspect that it is not truly essential. That is to say, I’m willing to believe that it is possible to have a really great sandwich that isn’t balanced. In place of balance, it seems, one can rely on harmony. Harmony feels like a cousin to balance, but still quite distinct. Where balance speaks to evenness, harmony simply suggests agreement. Elements that cannot achieve uniform value can aim for concordance, the strong and the weak working together to the benefit of the sandwich. And that is what I found in my pulled pork sandwich. The pork was done in a slow cooker, so sadly it was missing the bark of a genuine smoked shoulder, but a rub heavy on spicy paprika made sure it was plenty flavorful. 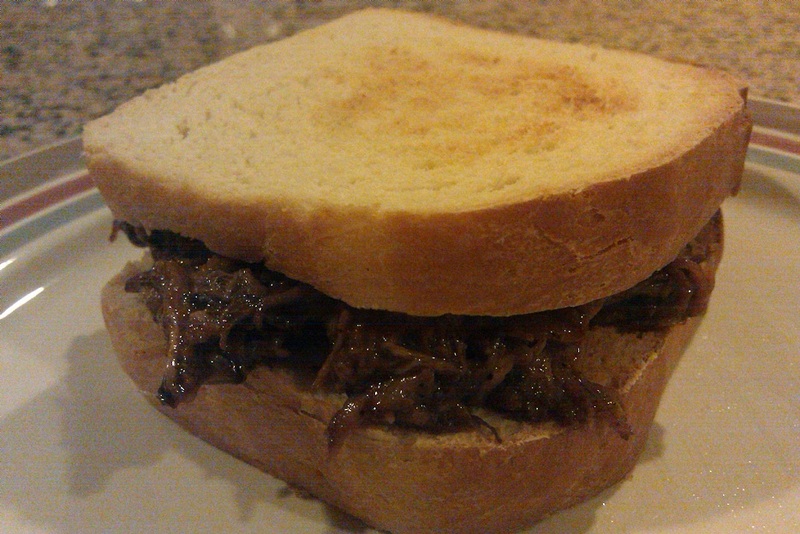 Tossed lightly in a sweet sauce (I like my pulled pork a little dry), it was a very fine sandwich. The bread was a big part of that. White bread, even when homemade, is still white bread. I admit that, and even though my friend may call me unsophisticated or childish, I will say that is a benefit. What it lacks flavor it gains in simplicity. It plays host to the pork, gladly yielding stardom. If we wish to seriously consider the full spectrum of what can be accomplished with sandwiches, we must not spend our time bemoaning the limits of our ingredients, but instead search for the places within those limits where we can most excel. Go get yourself a loaf of white bread and start walking that tightrope. I hope your heart races and the tastes sing. This entry was posted in Sandwich Reviews and tagged Pork, Reviews by Pete, Sandwiches I Have Made by Pete. Bookmark the permalink. I think the key thing is to consider the sandwich as a cohesive unit. The quality of the individual ingredients is in some sense subordinate to the sandwich as a whole, to the thing which is created when they’re combined. Although sandwiches can be saved by one ingredient, at that point the flavor and enjoyment is coming from that ingredient and not the sandwich. It’s absolutely fundamental that the sandwich is more than the sum of its parts – it’s not simply a collection of food items consumed together, but a discrete entity. So while white bread is absolutely less flavorful and wholesome than wheat bread, it may add more to the sandwich. More than the sum of its parts — wise words! I like the way you think, Doug.